At the January SCOUG meeting several of us were discussing passwords and security. The conversation turned to programs like Keyring/2 demonstrated last February. 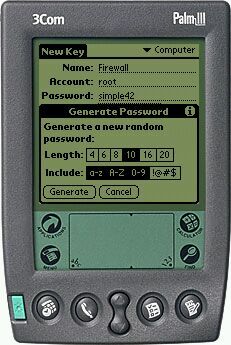 For those that missed it, this handy program keeps track of the plethora of passwords required to exist on the Internet. Keyring/2 uses robust encryption techniques so that your password list (or account numbers, PINs, etc.) are always safe. I complained that I needed such a program but spent too much time away from my computer to make it practical. 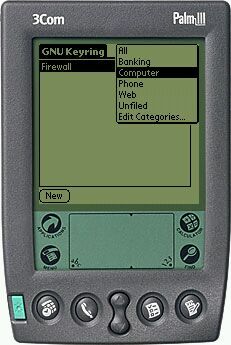 The answer is GNU Keyring for the Palm Pilot. 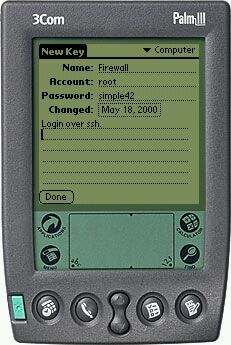 This handy application is similar in concept to Keyring/2 with the added advantage of portability of the Palm Pilot. In addition, Keyring uses the GNU Public License and is an Open Source effort. That's all there is to it! If you're using the Windows tools or other synchronization manager, it should be straight forward to install. Keyring is protected by a master password which you choose when you first install it. This master password is critical - it should be easy for you to remember but not easy for someone else to guess. Remember, with the master password someone else would have access to all of your passwords and account information! One added issue with a pilot based application is how easy it is to write in the graffiti area. Normally longer passwords are preferred, but I chose a relatively short password (five characters) to make it quick and easy to get into the Keyring list. Creating new records is a snap. Once you have entered several records and are interested in retrieving a password just click on the appropriate entry. If you need a keyring application, you probably have a fair number of passwords to manage. An additional tool Keyring provides is the ability to categorize your Keyring records (much like the date book application in the Pilot). Just use the category drop-down in the upper right corner like the other Pilot applications. The good news is that this category list is exclusive to Keyring so you can tailor it to your password list. Selecting a new password is always a hassle. Most of us are not very creative when it comes to creating passwords. The result is our passwords may be too easy to guess. Keyring includes an option to let it create a random password for you. You select how long to make the password and there are options for alpha, alphanumeric, mixed case and special characters. Using this feature and the Keyring list, there's no reason to use an easy-to-guess password. GNU Keyring is the right tool for the job. It's simple, straightforward, secure, and portable. Best of all it's free! You can download it from http://gnukeyring.sourceforge.net/. While you're at it, check out the rest of the sourceforge.net site - you'll find some interesting Open Source projects underway.